Tags: 2020VQ, Autumn, challenges, Inspiration, outdoors, Puppies, Quinn, Randy, success, Support, winter. 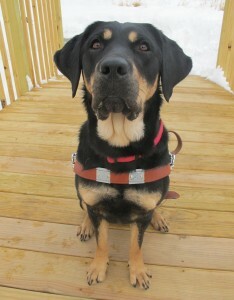 Guiding Eyes shares fantastic news and begins a new chapter in Randy’s and Tracy’s lives! 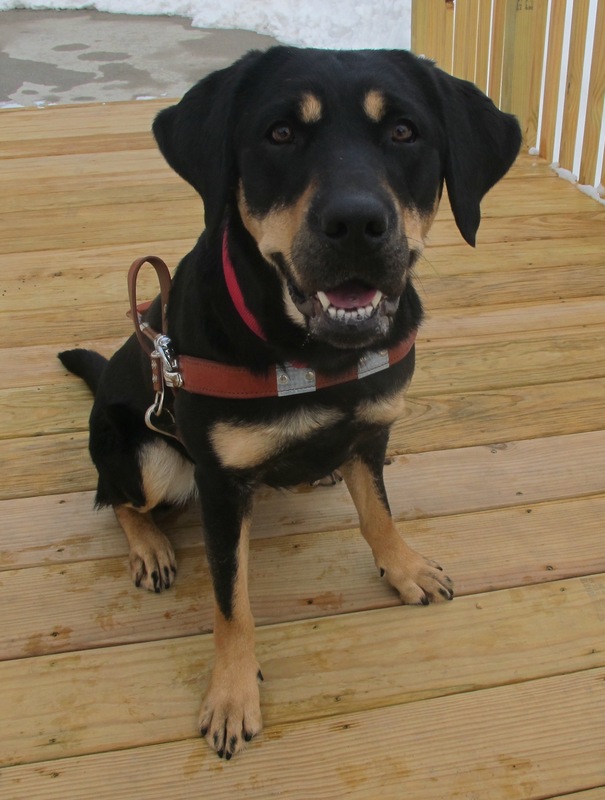 Meet Autumn, Randy’s new Guide Dog partner, arriving in Nashua on March 16. Every Winter’s passing welcomes springtime to our lives. The many thousands of people so fortunate to have known the Mighty Quinn endured a most harsh winter. I will certainly honor and celebrate Quinn’s life, love, and many accomplishments. Spring will arrive to New England on March 20th this year, but my darkest of winters will ease as Autumn, my new Guide Dog, arrives to Nashua on March 16. No dog would or could replace Quinn just as it was for Ostend and Modi before him. The new arrival will bring joy, freedom, and likely much love anew and begin a journey with so much possibility for our own marvelous moments. Autumn is a 60-pound, 2-year-old “Black and Tan” Labrador retriever from Guiding Eyes for the Blind. 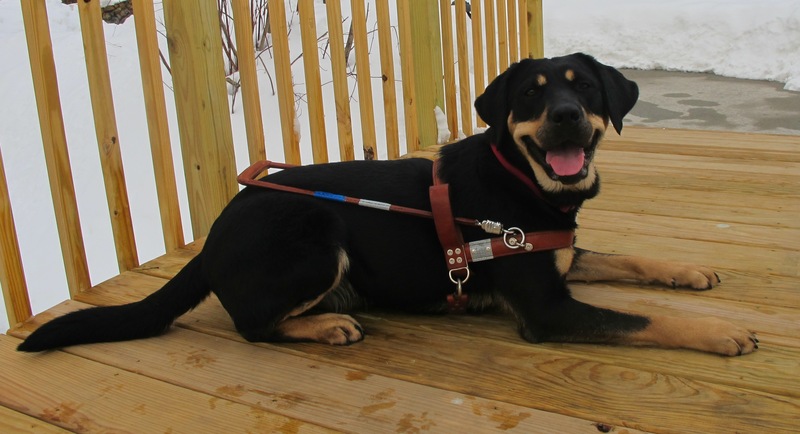 The Black and Tan is a fairly rare color variation for the breed which already makes this girl a little extra special. She has been described as a “spitfire” with plenty of speed, a passion for working, and a love for the snow. That last bit may prove beneficial in our training which will begin, as mentioned, on March 16! We have been selected to undertake the 10-day home training program which is an intensive and localized training right here on the snowy streets of Nashua, NH. We may travel a bit to ensure exposure to all the various possibilities we might wish to experience together, such as a subway, but the primary focus will be on the basic needs and special attention to all the challenging routes which are part of my normal routines. She’ll learn with me our local bus system, the City Room Café(! ), the YMCA, Mine’s Falls trails and probably even a school visit! As one added but very special bonus, the trainer who gave Quinn the foundation we took to incredible heights will be joining us for this training and transition. Each dog is different and part of the training is helping me to understand what Autumn needs and wants to make us the most effective team. I too am so very different from the 2006 version of myself who headed to Yorktown Heights, NY to meet with and learn from both Guiding Eyes and Quinn. The real beauty in building an effective and happy team is part of the incredible work performed by Guiding Eyes for the Blind and I could not be more excited to open myself up to all the learning and growing ahead for me and my next partner. Quinn changed me and my life in wonderful ways and now it’s time to begin an exciting new journey. I very much look forward to sharing the wonders along that path with my family, friends and the 2020 Vision Quest Community. Thank you all for the incredible, heartwarming love and support during the hardest parts of the last few months and thank you for joining us for this promising future with Autumn! Autumn smiles for the camera! What wonderful news–and what a lovely lady Autumn is, with her unusual coloring and winning smile. Congratulations Randy! This is FANtastic news and I am very much looking forward to seeing you and Autumn working very soon! Oh my gosh shes so cute! I can see there is going to be a new spark in the Pierce house! Im very excited for everyone involved. Autumn is to be congratulated. She won by being matched with a loving, caring, and totally devoted companion in Randy. She is beautiful. I am so happy to hear of the match and the nearness of the training. I hope she likes bikes. Thank you for the welcome to Autumn here and the many such on our 2020 Vision Quest facebook page. Our homepage is now updated with her ‘interview’ and other fun details. Ultimately fo rme, I am tremendously appreciative that this match has been found. I’ve had a lot of difficult reflections and I’m going to share one here too I guess. Modi came to me more than 20 years ago when as a young man with so very much to learn, he patiently taught me. I think of him as my spring dog in my life. No doubt Ostend arrived as my summer dog in so many ways. Quinn certainly made a legendary witner splash though I am not sure I can confine him to a season and Autumn…well she’s got the name already. The next 24 days will take a long time to pass I’m sure and yet when they pass I will be eager and ready to join a journey with her. I’ll share the many stories of all the wonderful and amazing dogs who I’ve had the fortune to share my life and ask her in the various ways we will communicate best what type of adventures she might like to pursue together. 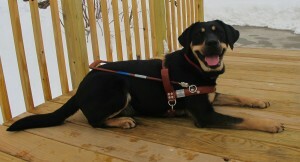 Randy & Tracy, I am so happy for both of you that they were able to find a new pup for you Randy. As a spitfire, she sound like she will fit right in. I cant wait to meet her and watch what new adventures you all will have. What better to follow the Mighty Quinn than a rare and beautiful Black and Tan Labrador. I look forward to your future together, to you and Autumn as a team and to the first guide dog to be part of Randy and Tracy together! Best to all. Randy, such wonderful news! I’m so happy for you all. I can’t wait to meet her! And I got my wish – score one for team Girl! Woo hoo! I’m sure her namesake, Kathryn Autumn Long, will be especially pleased as well! Love and joy to you all. I share what can only be a tiny portion of the emotions Randy must be feeling. So good to see a new partner for 2020 adventures. I hope Autumn enjoys a good game of tug-o-war during play time! Randy, I am so happy for you! When I came by to pick up the DVD from you a few weeks ago, you said you hoped to maybe be paired with another dog sometime this summer, so this was a surprise when I came to catch up with your blog today! In addition to being happy that you are getting a dog, I am happy for Autumn. She is getting a human who will love, respect, and appreciate her for who she is. Bless you both. She’s beautiful, although my wife informs me that Terry Pratchett has concerns about trusting dogs with orange eyebrows. I shall pour myself a Black and Tan and raise a toast in honor of this momentous occasion. I’m so thrilled for you and Tracy, Randy. Autumn is a gorgeous girl and I’m so excited for her to receive all the love in the world from the both of me. She has the perfect name to be a football fan and I know she’ll love Gillette. I just know Quinn will be with all of you every step of the way. This is wonderful news, Randy. Autumn is a lucky dog to be coming to live with such kind people who will make her a cherished member of the family. I hope it all goes well. March 16th will be here before you know it! Randy, congratulations on Autumn. It sounds like she will be a perfect fit for your lifestyle. No dog can ever replace another in our hearts and lives but there is always room for a new friend. I am confident that you and Autumn will build new memories on this next chapter in your journey. All of us at Memorial School will look forward to meeting her if you are able to visit us at the end of the year. I look forward to reading how things progress in the coming weeks with Autumns arrival and training. Congrats!! No one can replace Quin. But Autumn is sooo cute!??? ?